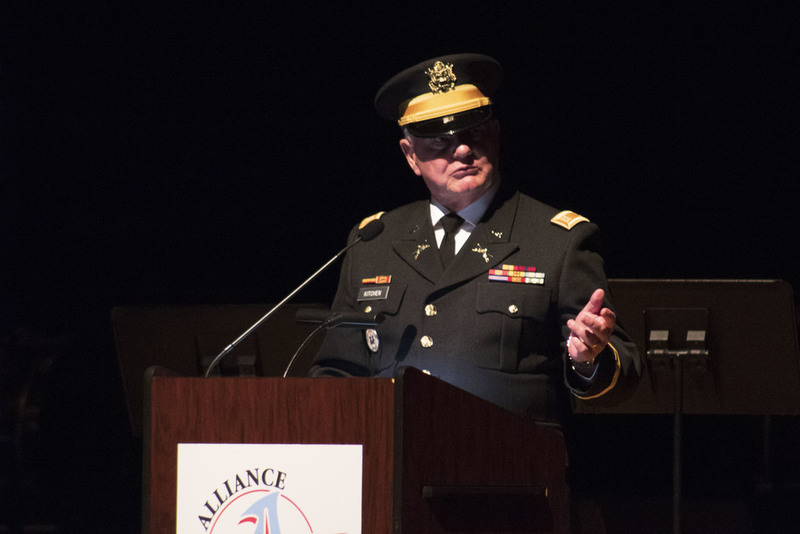 Alliance High School held the annual Veterans Day assembly on Monday, Nov. 12 to recognize and honor veterans. This year featured keynote speaker Ken Kitchen, a retired Marine and Vietnam veteran. 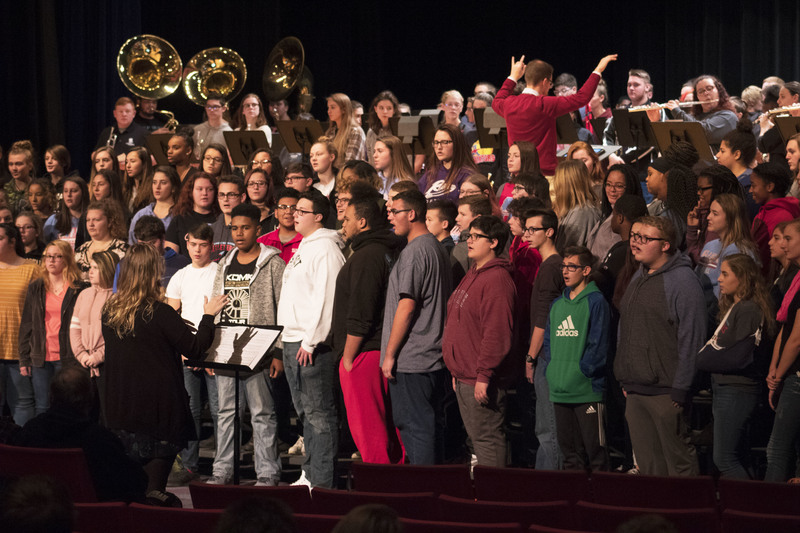 The assembly began with the AHS marching band and concert choir performing “Thank you Soldiers.” Sydney Vanderkar was the soloist for the song. A brief history of Veterans day was provided by Joe Beichler, an AHS history teacher. In 1919, president Woodrow Wilson named Nov. 11 Armistice Day. The name was later changed to Veterans day to recognize all veterans who had served their country. Following the history of the day of remembrance, Beichler introduced Kitchen. He grew up in Streetsboro, Ohio where he attended Triway High School and later the University of Akron and the Ohio Military Academy. Kitchen served in the military for 24 years as both an active serviceman and a member of the reserves. He served in Vietnam as a marine and in the Ohio National Guard and US Army Reserves. Following retirement from the Military, he served as a police officer for the Wooster Police Department. Kitchen took the time to explain the importance of an army and why we honor the men and women who have served their country bravely. Kitchen was 17 years old, like many others, when he decided to join the Marine Corps. The United States has a history of fighting and defending their freedoms and the freedom of others. Dating back to the American Revolution, the U.S. soldiers have fought bravely to protect people from the "bullies of the world," as Kitchen put it. Kitchen went on to explain the importance of the military to the United States. The military helps to provide peace. During his time in Vietnam, Kitchen recalled helping the Vietnam citizens in every way possible. He and his fellow soldiers would share food, water and anything else they could possibly spare. They provided aid to the sick and injured villagers they encountered. The soldiers kindness and assistance was more than they citizens had received from their own country. During the time of the war and for years after, there was a debate on whether the United States should have helped Vietnam. “Those who have never been to war can sit and debate such a matter, but those of us who have been there and have looked into the eyes of these children know exactly why were there,” Kitchen said. The United States military has never lost a war, Kitchen explained. The only way the United States can be defeated is from within when citizens take for granted the freedoms they have or by politicians whose primary concern is reelection. 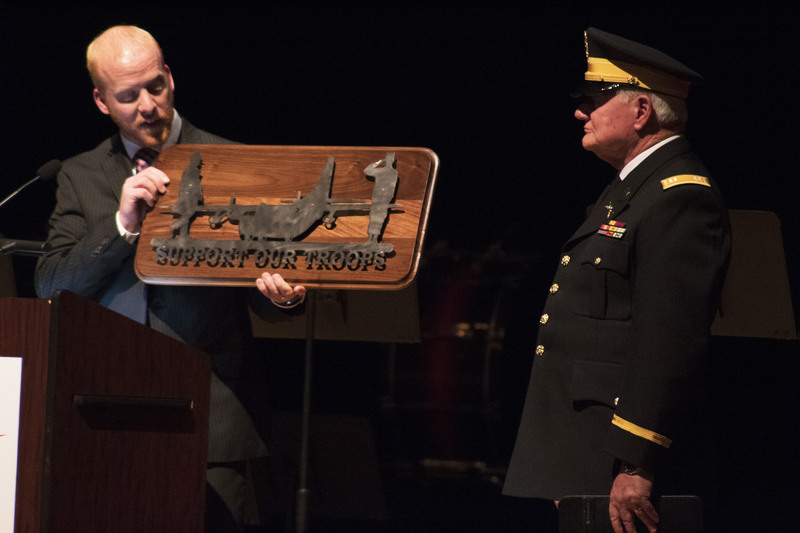 He encouraged the audience to learn our country’s history and to learn about the sacrifices the soldiers have made over the years. “Freedom is not free, the cost is extremely high,” Kitchen said. Kitchen was presented with a plaque made by the AHS welding students. The plaque read "Support Our Troops" with an image of soldiers and a place. The assembly ended with the choralaires performing the national anthem for the audience.